A little voice, deep inside inside had always squeaked something at me and I couldn't really hear what she was saying until it surfaced by chance in the summer when I did my first styling gig with Bill Granger. After years of watching and loving Jamie, Nigella, (even Ramsay & Delia), Stein, Rachel Khoo and Saturday Kitchen, I am somehow landing a few jobs behind the scenes as a food stylist, as a home ec person, as a prop stylist and even being the actual talent myself on camera! ha. I went to work with Gregg Wallace, (to be aired on BBC1). I was quite nervous as I heard he had a reputation for being rather vocal. And yes, he was. He challenged me as soon as he met me but because I knew what I was doing and I had everything ready for him we became friends on set and I really enjoyed working with him and listening to his outrageous jokes. Uyen! Like you and me, he kept chuckling as he'd throw his heavy arms around my shoulder. Weeks later, I was even called back to work on the remainder of the shoot which I was very pleased about because I had the opportunity to go to the beach in England which was something I had wanted to do all summer. I had to make 650 tripled fried chips, cut with an apple corer. Took me 13 hours! 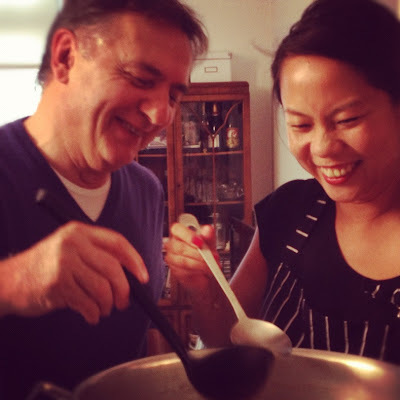 Then I was lucky enough to work with Raymond Blanc. The set, my kitchen! I spent a whole week organising and propping my kitchen and then food styling as well as working with Raymond in front of camera (to be aired BBC2, Winter/ Spring). It was an absolute honour to work with one of the finest figures in food.